KIEV, Ukraine -- Ukrainian anti-corruption investigators have detained an influential former member of parliament and a senior energy executive, as Kiev’s authorities come under domestic and western pressure to crack down on top-level graft. Former Ukrainian member of parliament Mykola Martynenko, under investigation for suspected embezzlement, speaks at a court in Kiev on Friday. Agents from Ukraine’s national anti-corruption bureau (Nabu) detained Mykola Martynenko, a close ally of ex-prime minister Arseniy Yatsenyuk, on Thursday night for allegedly embezzling $17.3 million (€16.2 million) through a crooked deal to sell uranium at inflated prices to a state-run enrichment plant. As part of the same case, Nabu agents on Friday detained Sergiy Pereloma, the first deputy chairman of Ukraine’s state gas company, Naftogaz. Lawyers for both the accused denied their involvement in any wrongdoing. Nabu detectives swooped on the powerful pair less than two months after detaining the head of Ukraine’s tax agency, Roman Nasirov, on suspicion of defrauding the state of some €70 million in tax payments, to the benefit of firms linked to fugitive deputy Oleksandr Onishchenko. Mr Nasirov denies the charge, and is under house arrest after paying bail of 100 million hryvnia (€3.5 million). 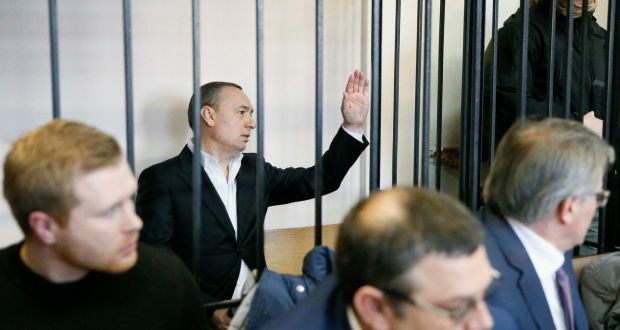 Prosecutors asked a Kiev court to hold Mr Martynenko in pre-trial detention or set bail at a colossal 300 million hryvnia (€10.5 million). “From the start of the investigation [in December 2015], Nabu detectives sent 16 requests for international legal assistance to eight countries,” the anti-corruption agency said in a statement. Igor Cherezov, a lawyer for Mr Martynenko, said the allegations were politically motivated, and insisted his client would fight them and had no intention of fleeing Ukraine. He also dismissed suggestions that Mr Martynenko could be struck down with a sudden illness during the legal proceedings, as apparently happened to Mr Nasirov, who was carried into court on a stretcher and observed proceedings from beneath a blanket, drawing ridicule from critics. Mr Martynenko, who formerly served as head of the energy committee in Ukraine’s parliament, resigned as a deputy in late 2015 amid reports that he was being investigated in Switzerland on corruption allegations he also denies. He was the deputy chief of Mr Yatsenyuk’s People’s Front party, and reputedly an extremely influential figure in the backroom dealing that still dominates politics in Ukraine, much to the frustration of its people. Mr Nasirov was the first really powerful official to be detained on graft charges since Ukraine’s 2014 revolution, which was above all fuelled by widespread fury at corruption and the impunity of a venal elite of political and business cronies. The western states and lenders that are propping up Ukraine financially, helping guide its reforms and backing its bid to pivot away from Russia and towards Europe, have demanded greater effort to tackle corruption. In releasing its latest tranche of aid to Ukraine this month, the International Monetary Fund warned Kiev against “possible policy reversals as key reforms face strong pushback from vested interests”.